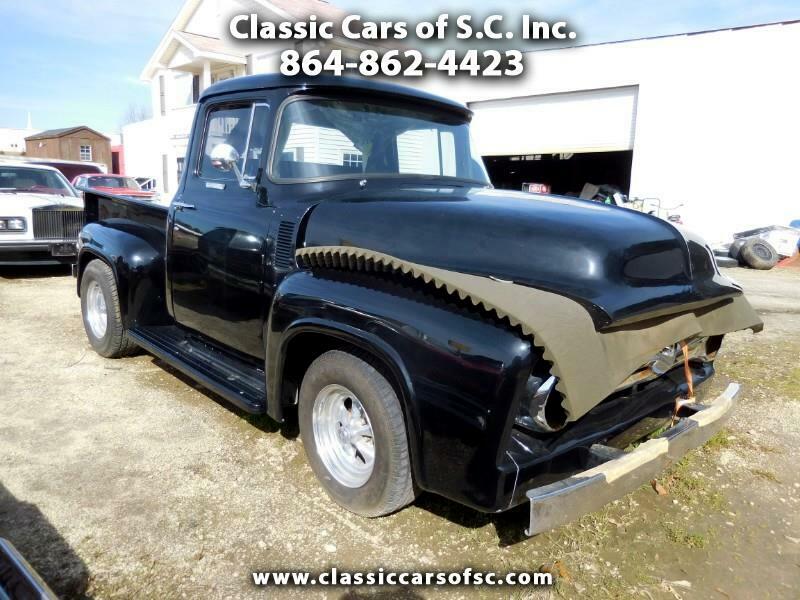 Used 1956 Ford F-1 Pickup for Sale in Gray Court SC 29645 Classic Cars of S.C. Inc. This is a beautiful 1956 Ford Pickup that is being lovingly redone! It has been recently repainted in an almost flawless black paint. It is powered by a 302 engine with serpentine belts and lots of chrome under the hood and I also have a new carburetor. It has, what I believe is a, Crown Victoria front suspension under it. It has an automatic transmission, new stained and finished oak wood flooring along with stainless bed strips for the bed, new aluminum gas tank, new aluminum radiator, new chrome tail lights, chrome Ididit tilt steering column, plus a lot more! She needs finishing and the price reflects this! Don't let it get away! Give me a call so we can talk about how we can make my vehicle yours. You can own this vehicle for only $18,000. I might consider a possible trade, what do you have? What are you looking for? Let's talk!!! I sure would love to make this Classic yours. What can I do to make that happen? If this Classic is the vehicle of your dreams then the best time to buy it is BEFORE someone else does. NOW is the time. The customer who may have looked at it yesterday and said I will buy it tomorrow may come back and buy it today while you are waiting to buy it tomorrow. Do not wait another minute. Give me a call right NOW so we can make this beauty yours. RIGHT NOW. You will be GLAD that you did!!! We specialize in Father and son restoration projects. We are located in the northwestern part of South Carolina 20 minutes south-east of Greenville. Drop by anytime and take a stroll through our Field of Dreams. You may just find that car of your dreams. I hope to see you soon. Give me a call on my toll-free number at 1-866-942-7716 so we can talk person to person about this car. If you happen to be out of our toll-free calling area call us on our regular number at 1-864-862-4423. We ship all over the world at your expense. We always have dozens and dozens of collector cars available for sale at all times. Visit Classic Cars of S.C. Inc. online at www.classiccarssouthcarolina.com to see more pictures of this vehicle or call us at 864-862-4423 today to schedule a look at this classic. We have shipped to just about every state in the US and 34 foreign countries. If you like you may text or call me at 1-864-313-2908 to schedule your personal visit to inspect the truck for yourself. Message: Thought you might be interested in this 1956 Ford F-1.